With only 54 miles to go today we had time to walk to downtown Daytona for breakfast. It was only about 3 blocks and very attractive. (see photo). 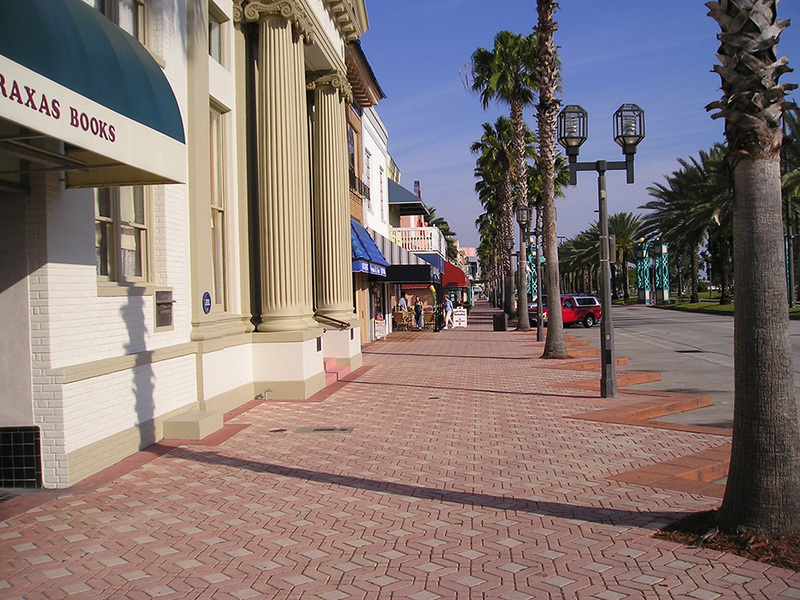 Daytona is very keen on recycling with mini-centers every block or two on the waterfront. Each includes and oil recycling container. The ICW from Dayton to St Augustine is built up on both sides of the canal about 60% of the way. It was probably the least scenic so far. The marina at St. Augustine has the biggest sailboats we have seen so far. They can only sail outside the barrier islands as their masts are 80 feet high, much to high to pass under the 60 foot bridges. The one in the photo must be close to 80 feet long and is registered in the Cayman Islands. A tax dodge used by super yachts. One came in beside us and used its thrusters to get to the dock.. There are 3 other boats here that attended the America?s Great Loop Cruisers Association rendezvous last fall. Most had spent the winter in the Bahamas and were now sailing north. Tomorrow we will spend in town seeing the sights.